WBC Featherweight World Champion Gary Russell Jr. (28-1, 17 KOs) and unbeaten No. 1 contender Joseph “JoJo” Diaz Jr. (26-0, 14 KOs) hosted a press conference and faced off for the first time Tuesday before their championship showdown Saturday, May 19 live on SHOWTIME from MGM National Harbor in Maryland. Tickets for the event, which is promoted by TGB Promotions in association with Golden Boy Promotions, are on sale now and are available by visitinghttp://mgmnationalharbor.com/. The Russell vs. Diaz fight is part of a split-site SHOWTIME CHAMPIONSHIP BOXING telecast that will feature WBC Light Heavyweight World Champion Adonis Stevenson defending his title against two-division world champion Badou Jack in a main event from Toronto presented by Premier Boxing Champions. Russell Jr., a 2008 U.S. Olympian and 126-pound titleholder since 2015, will defend against his mandatory challenger in the 25-year-old Diaz, who represented the U.S. at the 2012 Olympic games and will be competing in his first title bout. “It’s amazing to be fighting at home. It’s cool to know that the people I see around all the time will be able to get in the car and drive 15 minutes to come watch this massacre. I can’t wait. “I appreciate JoJo for being honest and saying that he feels I’m the best featherweight in the world. That speaks volumes. “We stay focused in the gym. The inactivity doesn’t mean anything. It’s no issue. I’ve had hand issues in the past but I’m able to preserve my body and stay sharp, stay focused. I’m a fighter that’s always in shape. I never take a day off. You can ask my wife. On anniversaries, we’re in the gym. On birthdays, we’re in the gym. “Regardless of what the situation is, you want a sense of financial stability for yourself and your family. I’m at the point of my career where I have maybe six more fights in me. We want to maximize everything. We want to maximize our revenue and it’s been irritating because a lot of the champions don’t want to get in the ring with me. I appreciate JoJo for giving me the opportunity to sharpen my teeth a little bit more. At least he’ll have the opportunity to say he got in the ring with Mr. Gary Russell Jr.
“I’m one of the most dangerous fighters on the planet. Speed, power, ring IQ, we can get ugly if we need to. I don’t plan on going 12 rounds. I’m not going the distance with anybody for the remainder of my career. Mark my words. “When you have guys that fight and move around a lot, it makes it difficult to get to them the way you want to. When you have a guy that is straightforward and will be in your face, it makes it much easier for me and they’re much more susceptible to get hit. “A lot of fighters win with pure athleticism because they’re faster, stronger or in better shape. They’re not winning because they have the ability to make the necessary adjustments based on what goes on in the ring. I tell people all the time that boxing is intellect manifested on a physical form. In most cases, the more intelligent fighter wins. “My father says that whenever you see a fight that is an all-out, knockdown war, it’s just two stupid fighters that didn’t have a plan B or the ability to make the adjustments to make the fight easier. If that’s JoJo’s game plan, it’s going to make this fight a lot easier for me. It’s not going 12 rounds. “As far as a hit list of my next opponents goes, we are first going to take care of JoJo. I would love to get a unification bout with Leo Santa Cruz after that. If we don’t get that, I plan on moving up in weight and challenging whoever has the title in that division. You want to know who I really want, though? I want Mikey Garcia. “My last fight will be against (Vasyl) Lomachenko. I want to conclude my career with breaking my foot off of him. That will be the conclusion of it. I’m willing to wait, though. Right now, we’re good. “Of course I would entertain a fight with Gervonta Davis. We’re cool. He’s somebody that I actually watched grow up and develop as a fighter, but you have to stay in your lane. When I move up in weight, he’s got to get out of the way or he’s going to get ran over too. “I didn’t want to come home to fight until I had a world title. That’s the reason I didn’t fight at home for so long. Now we have the title, and I wanted to fight at least one more time here. “I don’t think the fact that I’ve been more active will give me any advantage. I’m just doing what I’m supposed to be doing and getting the experience I need inside the ring before facing an elite fighter like Gary Russell Jr. My preparation has been good. I’ve fought tremendous opponents and I have all the experience to come out victorious May 19. “It doesn’t affect me at all fighting in his hometown. I’m happy to fight in his backyard. He’s the champion and that’s what champions get to do. I know what he’s capable of doing. He says I don’t have the boxing IQ or the power and speed that he has, but he’s going to be in for a rude awakening come fight night. He’s going to see that I have all the tools. “It’s a dream come true to be fighting on this stage. Ever since I roomed with Errol Spence at the Olympics, we always promised each other that once we became pro we were going to fight all the elite athletes and the best champions. 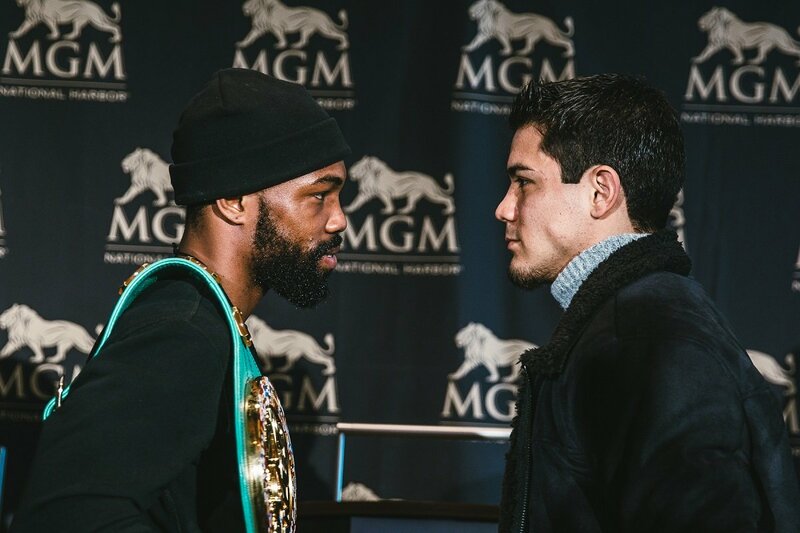 Gary Russell Jr. is the best at 126 pounds. I’m not scared to fight him and that’s what Errol Spence did, too. He beat Kell Brook in his hometown. “Gary Russell Jr. is by far the best featherweight in the world. Leo Santa Cruz, Abner Mares, Lee Selby, none of these guys want to fight Russell. They’re afraid of the speed and the counter shots. But I know what I’m capable of doing and I’ll showcase it May 19. “A win would mean everything for me. It would be a dream come true realizing all of the hard work I’ve put in since I was 13 years old. It would mean that I’m the champion and I’d be the shot caller. “I think his speed is an obstacle; he’s very fast. But that’s the thing about me, I’m good at adapting to any style that I fight. Come fight night I know that his speed is going to be fast, but it’s nothing that I won’t be able to take, or nothing that will shock me. I’m going to be able to adapt to that speed and make sure I’m able to land my shots when he’s opening up. “I’m very confident; 100 percent confident I’ll beat him. I know that this is an opportunity that is presented to me and I’ll be victorious. I’ve always prayed to God that I could fight on SHOWTIME and for a WBC title. And now that I am it feels like it’s all settling in and it’s all coming true. I’m working hard every single day, and once I get my hand raised in victory I’m going to go from there. “If he gets a little bit over confident like he did against [Oscar] Escandon, he’s going to be in for a rude awakening. He’s going to be shocked with not only my punching power, but also with my combinations and with my speed. I’m not like a Jhonny Gonzalez where I’m just throwing one shot, or slow combinations. I’m pretty fast with my punches and you won’t see my punches coming because I throw them very elusive and I punch from different angles. He’s going to be very shocked if he fights the way he fought Oscar Escandon.